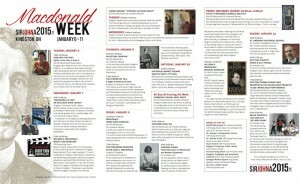 Macdonald Week was presented by SALON Theatre with the support of the Department of Canadian Heritage and the City of Kingston. We are proud to have created such a diverse and exciting collection of artists, activities and events in commemoration of the bicentennial of Sir John A. Macdonald, Canada’s first prime minister. Our mandate was to engage the entire Country and raise awareness of the life and legacy of Sir John A. From our home base in Kingston, we offered the gift of the arts, inspired by John A.. Support from our partners means all of these events were presented free of charge. Macdonald Week was the culmination of our four-year-long project SirJohnA2015.